2019 Free Agent Tracker Is Up! 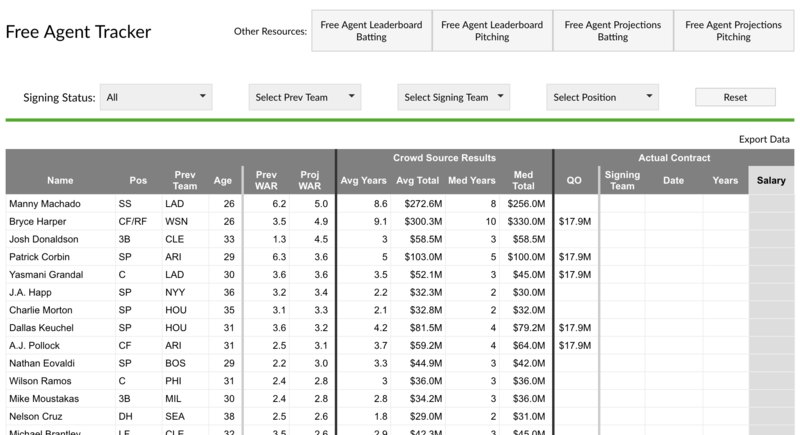 Our 2019 Free Agent Tracker is now live, housing the results from our crowdsourcing effort from the last two weeks. It will update with new contract data as free agents sign. You might notice a new interface: readers are now able to filter the board choosing multiple teams and multiple positions. Also, in the top-right corner, we’ve put links to leaderboards and projection boards for the free agents. The crowdsourcing numbers include both the average values and the median values for prospective player deals. The projected WAR uses the Depth Charts projections available on the projection page and player pages. At this point in the offseason, the Depth Charts projections closely reflect Steamer, but the playing time might differ slightly. ZiPS will be added at a later point in the offseason. We hoped you liked reading 2019 Free Agent Tracker Is Up! by Sean Dolinar! 2019 Steamer Projections Now Available! Nice work on the new interface. A column for AAV for both the projected and actual numbers would be a nice bonus.